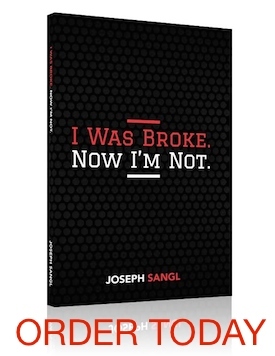 Welcome to a new series on the wildly popular JosephSangl.com! In this series, I will be sharing what I believe are Fundamental Rules Of Money Management. I look forward to reading your thoughts on this topic! Rule #3 Nothing will happen until you do something. I used to work a J.O.B. I was energetic enough because I am a naturally hyper person, but I was working a J.O.B. Instead of waking up in the morning and saying, “Good morning, Lord! I can’t believe I get to do this!! !”, I would wake up and say, “Good Lord. It’s morning. Where’s the coffee?” I wanted to do work that made a difference. I think most people fall into that category. There is nothing more miserable than working a J.O.B. that makes absolutely no difference in anyone’s life. I have met a lot of people who feel stuck in their job. They hate it. To say that they “despise” their job would not be overstating it. They want to do something else, but they feel trapped. I have been there. I decided to do something about it. I began to offer free financial counseling for members of our community. Trusting people allowed me into their homes to help them prepare a written spending plan or to develop a strategy to become debt-free. Those people allowed this crusade to become a reality. But it would not have happened had I not made the first move. This rule applies to all areas of life. Want to go out on a date with that girl? Better do something – ask her! Want the next promotion? Let the boss know that you are interested – and prepare like crazy so that you are ready for it! Want to win with your finances? DO SOMETHING about it.